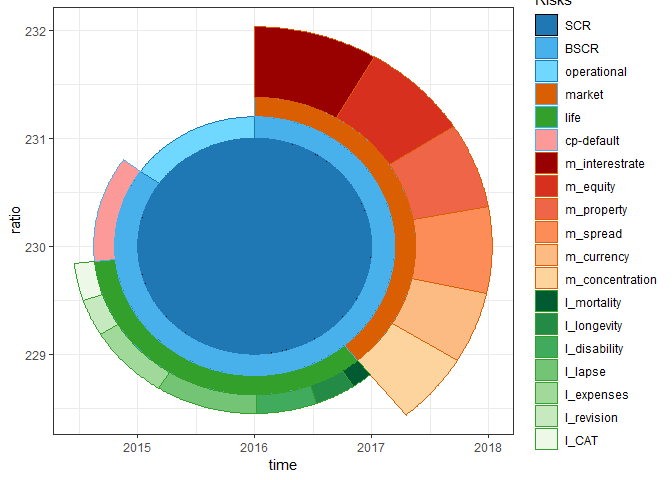 An implementation of 'ggplot2'-methods to present the composition of Solvency II Solvency Capital Requirement (SCR) as a series of concentric circle-parts. Solvency II (Solvency 2) is European insurance legislation, coming in force by the delegated acts of October 10, 2014. < https://eur-lex.europa.eu/legal-content/EN/TXT/?uri=OJ%3AL%3A2015%3A012%3ATOC>. Additional files, defining the structure of the Standard Formula (SF) method of the SCR-calculation are provided. The structure files can be adopted for localization or for insurance companies who use Internal Models (IM). Options are available for combining smaller components, horizontal and vertical scaling, rotation, and plotting only some circle-parts. 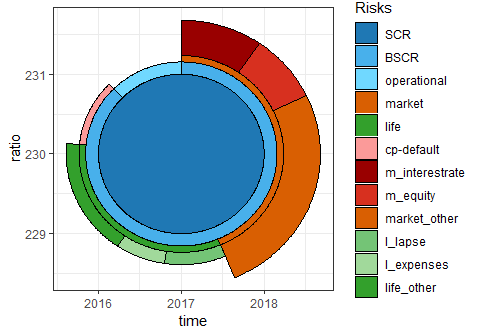 With outlines and connectors several SCR-compositions can be compared, for example in ORSA-scenarios (Own Risk and Solvency Assessment). 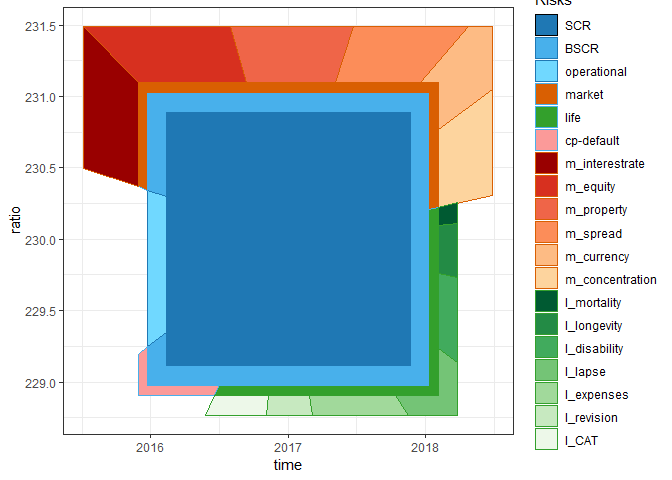 The goal of ggsolvencyii is to provide ‘ggplot2’-geom’s to show the composition of the Solvency (II) Capital Requirement (SCR) from (diversified) risks and subrisks, whether for standard formula (SF) or (partial) intern models (IM/PIM). This README is a short version of the vignette ‘ggsolvencyii’ at https://cran.r-project.org/web/packages/ggsolvencyii/index.html which shows the same examples with more code. The complete annotated code for the first figure is shown in vignette ‘showcase’. A further elaboration on the inner workings of the package and the use of parameter-values and tables can be found in vignette "coding overview’. 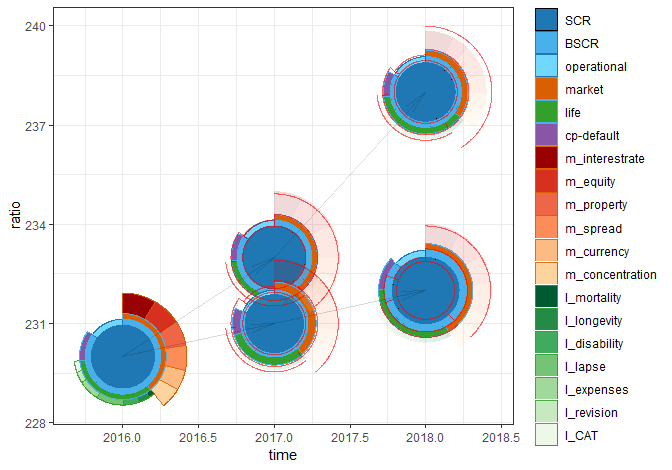 ggsolvencyii builds on ggplot-functionality and provides three geom’s: geom_sii_risksurface, geom_sii_riskoutline and geom_sii_riskconnection. These three geom’s were used to produce the following showcase plot which might be used for an ORSA (Own Risk and Solvency Assessment) report. 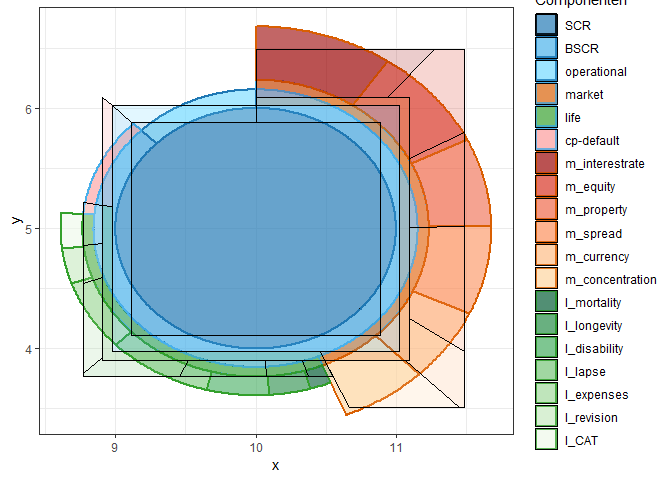 The total surface (to the centerpoint of each circle) of the outer segments show the size of undiversified risks. Diversification is made visible by the difference between the risk segment and the next segment nearer to the center of the plot. The red (out)lines are displayed for comparison with the previous SCR buildup. An life insurer reports its solvency ratio following Standard Formula rules, with English names for all risks. It has a set of risks, diversification effects, and accumulations to the SCR for the current situation (‘id’=1) and two two-year ORSA scenarios. where sii_z_ex1_data a tidyverse transformation is of the data. Geom_sii_risksurface uses one default table for this plot sii_structure_sf16_eng. It defines each risks by indicating from which combined ‘child’-risks and diversification (suffix ‘d’) it is made up. Passing another structure table makes this geom usable for localisation or for internal models. To prevent cluttering of the legend it is possible to group the smallest items of a level by providing a levelmax-table in such a way that the indicated maximum items in that level is not exceded. the example is on another dataset sii_z_ex2_data, with only one SCR result. rotationdescription Rotates the plot in such a way that the indicated item (can be on either level, i.e. works also on ‘life’ or ‘operational’) is plotted on just on the righthandside of ‘12 o’clock’. `rotationdegrees’ provides an added rotation. The example rotates ‘m_equity’ to 12 ’o clock, and then 45 degrees counter clockwise. The second plot shows a comparison between a circle and square plot of the same data. Note that the radius of the SCR circle is smaller than the size of the SCR square and that angles are different because in the corners there is 'additional' surface available compared to a circle. ### scaling all SCR-buildups from a single call to geom_sii_risksurface or geom_sii_riskoutline plot are by default scaled in such a way that the largest SCR has a plotradius of one. When combining more calls, with several datasets a manual maxscrvalue-value can be given as a parameter. To prevent distortion, depending on the scale of x and y axis, scalingx and scalingy parameters are available. The plotdetails table can be passed as a parameter to geom_sii_risksurface and geom_sii_riskoutline. It indicates whether to actual plot surfaces or outlinesegments (1 to 4) after the composition of the round (or squared) layout of segments. An example is the seperate plotting of inner and outer segments, with different transparancy in the showcase, or only plotting the outline of the SCR itself and the lowest risklevels. See the separate vignette for a detailed explanation. additional parameters, some in the form of tables, can be used for determing what parts of the calculated circle-segments to plot (‘plotdetails’), scaling (‘maxscrvalue’, ‘scalingx’, ‘scalingy’), or for easy comparison between two instances of a SCR buildup (aesthetic ‘comparewithid’). "Functions like n(), row_number() ... that are typically used in dplyr verbs must now be imported when used in packages and scripts, otherwise the error Error in n() : could not find function "n" will appear." initial release, see how much interest this package attracts before further development and documentation.